Natursutten Natural Rubber Pacifier is made from the Hevea Brasiliensi tree. These natural pacifiers are non-toxic and baby safe. They have no artificial colors or chemical softeners, and are free of parabans, BPA, PVC, phthalates and other hormone disrupting substance. 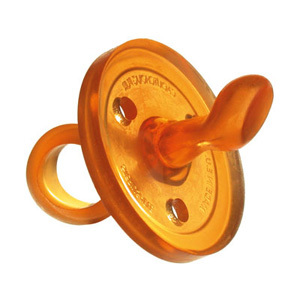 These natural rubber pacifiers are extremely hygienic because they are molded in one piece, with no joints or cracks where dirt and bacteria can accumulate. Natursutten natural pacifiers have a larger shield than other conventional pacifiers, in order to prevent babies from squeezing enough to get into their mouths. Absolutely no allergy causing substances (the protein that on rare occasions can provoke a latex allergy is completely eliminated during production).